In this application note we explain how the equivalent circuit model of an inductor can be derived from its impedance spectrum. Power inductors are an essential component in every power electronics circuit. A good model is essential for every simulation including inductors. The Bode 100 enables easy extraction of the parasitic elements of an inductor. Not all magnetics manufacturers are providing detailed information about the parasitics of their inductors. The Bode 100 eases the analysis of inductors and makes the derivation of a small signal equivalent circuit model an easy task. 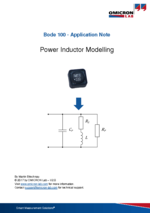 In this application note we show how the Bode 100 can be used to measure the winding resistance and inductance of an inductor. Furthermore the self-resonance frequency of the inductor is measured in order to derive the winding capacitance of the inductor. The measurements are performed using the Bode 100 in conjunction with the B-WIC impedance test fixture. Check out this great educational video on power inductors and their AC losses by Prof. Shmuel Ben-Yaakov.